This vintage film footage shows Egyptian officials examining items of jewelry once owned by the royal family ahead of a planned auction. The Egyptian Revolution of 1952 led to the abdication of King Farouk I in favor of his baby son, Fuad II, but the country was declared a republic in 1953. British Pathe dates this footage to 1954. But did the auction really happen? There are apparently doubts, in part because the first tiara shown, Princess Shwikar's elaborate diamond and platinum scroll tiara, is still at the Royal Jewelry Museum in Alexandria. 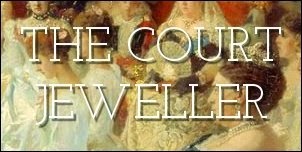 Which jewels were sold to the public in 1954, if any? Apparently that's still not been resolved.